"The Hyrulians and the Outcast" play at Fannatiku! The Hyrulians and the Outcast band played at Fannatiku Fest in St. George, Utah this past weekend. If you have not heard about this one hit wonder of a band then you are in for a surprise. The band is led by Skull Kid on his killer Ocarina. Sheik plays the lyre and often joins Skull Kid on the guitars. The band's lead singer, Link, may seem quiet in interviews but he has one heck of a voice on stage. The band practicing for their gig. The group formed at the fest on a whim when they realized their (lack of) musical talents matched perfectly! The group actually has one song, which was number one all day (of course there were no other bands to compete with them.) This hit song is called "HHYYAAAHHH" and was written by Sheik, although Link seemed to reinterpret the lyrics into grunts and shouts. practicing his Ocarina one note solo. In an interview the group talked about how their inspiration for their music came from the need for Hyrule to have more rock and roll. Polls say the Gorons agree with this wholeheartedly with only 2% disagreeing. Ouran High School Host Club interviewing The Hyrulians and the Outcast. Before their concert the band players decided to try out some guitars in the gaming room. They were pretty good at that Rock Band game, so they were confident in their ability to play at the concert later. The issue of Sheik's gender came up. Still not sure what he or she is yet and she had no comment on the matter except to remove the mask and wink. I just like this picture so I added it in. Sheik then changed the subject to Outcast's true identity... the photo was lost about who was really under the mask, but here is a picture right before the reveal. The photo and my memories of who was under the mask seemed to have been erased. Time for the concert came and well, it looked pretty sweet. I wonder how they got the lasers and fire all of a sudden. The Hyrulians and the Outcast performing HYYYAAAHH on stage. The concert attendees seemed to have mixed feelings? Number 1 fan! Mami likes the music! Huzzah autographs! That book is not ominous at all. Looks safe to me! Well then... that ended abruptly. I hope you all enjoyed this gag post and my attempts at humor. Matt, Aella (my sister), and I all randomly decided to make a band and silliness ensued while at Fannatiku. The real Anime Fannatiku Fest post will come up later this weekend. As for the big news? This summer I will doing DOUBLE COSPLAY FEATURES each month. I will be showcasing locals and abroad cosplayers of all kinds. I want to get caught up on my list of people to show off, so cool things are on the way. I will also be reaching out of my comfort zone and trying to talk to some of my cosplay idols... think they will want to be featured? Guess we will find out :D Double features will start in either May or June, so stay tuned!!! Also, April will have THREE posts on our cosplayer feature. This month;s feature is a really good friend of mine and she has a lot of information to share! She will be leaving on a L.D.S. mission for a year and a half so she wanted to get everything said and done for this month before she departs. I'm going to miss her and look forward to when she returns! In the meantime, I hope you will all enjoy her posts for the next month. The first will be her interview, then a "How To" post and then a BONUS post on choosing sewing machines. 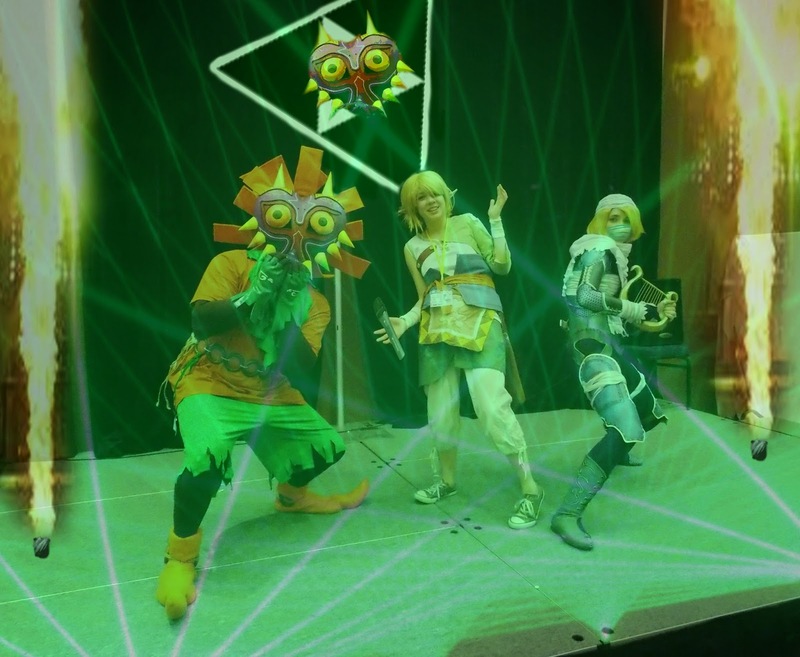 Now here is a video of Matt on stage as Skull Kid for the cosplay contest.